Workflow Sample: Episode 512: The Shortest Business Process in the World? Episode 512: The Shortest Business Process in the World? "I want to try business flow designing..."
In the world of "programming" it is said that "the only way to learn it is to write a program". In fact, everyone writes a program that displays a string "Hello World" at start learning programming. Similarly to this, "try to draw a Business Process" is very important even in the world of "modeling". 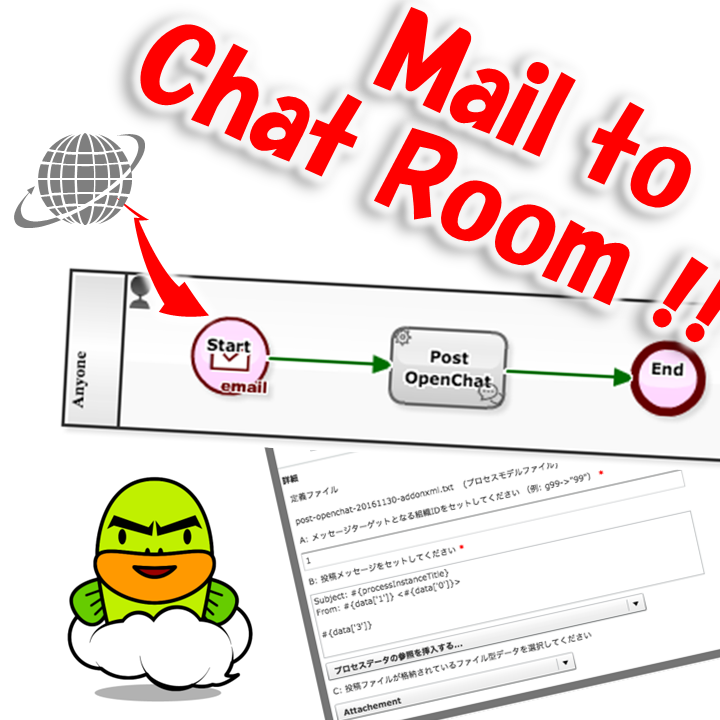 The following Business Process is started by "receive mail", and it ends with "chat post". It may be a Workflow on a"level that wouldn't admit" by a person who is modeling the various actual business of companies... But it also seems to have some sort of practicality. Consider, for example, a scene where the person in charge at the construction site shares "site photographs" within the company. Of course, there is a method of sending an "image attached email" to the in-house ML, but in some cases it is preferable to send it to in-house chat such as Slack or OpenChat. 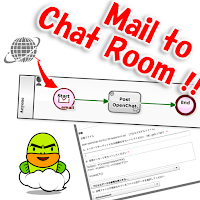 In such cases, you can simply set the send to address to "In-house chat posting address", if there is this Process. 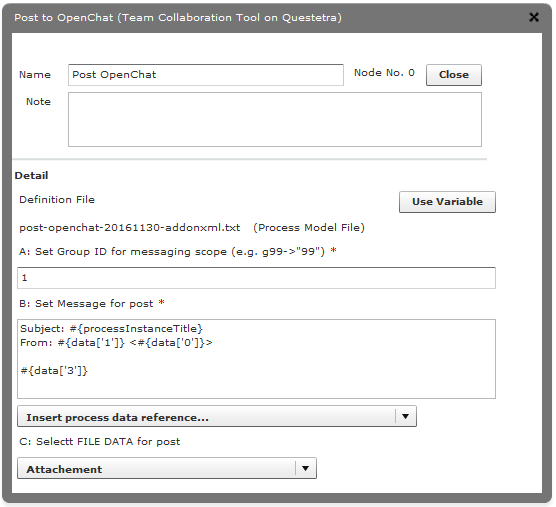 Incidentally, this "cooperation mechanism based on email receiving" is categorized in B1 of below, among the APIs provided by "Questetra BPM Suite", a Cloud-based workflow. After all, as it is modeled to accept control from the outside such as "incoming mail", so in this business process you can start a Process by "site photo from construction site".